Pakistan Press Club Web Desk. What is the point of travelling the world if you can’t share it – or boast about it- with desk-bound friends back home? Instagram, the popular photo-sharing platform, has become a fan favorite among travelers, who often post wanderlust-inducing photos from their worldly adventures to remind loved ones they’re on vacation – and very #happy about it. The app recently released its year-in-review data, which included, among other stats, the most photographed cities, locations and museums, based on geotagged data, of 2017. Instagram’s data team also highlighted the top hashtags and filters used by its global community of 800 million users this past year. 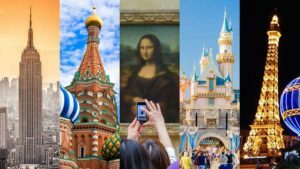 The Big Apple and the House of Mouse took the top slots for most photographed city and location, respectfully, while Paris’s Louvre Museum was the most Instagrammed museum worldwide (no doubt thanks to tourists’ countless selfies with the “Mona Lisa”). The Metropolitan Museum of Art in New York took first place among US museums, while Washington’s Hirshhorn Museum and Sculpture Garden cracked the top 10 – at No. 8 – for the first time, probably because of Yayoi Kusama’s wildly popular and photo-friendly mirrored infinity rooms. Nearly 160,000 people experienced the museum’s record-breaking Kusama exhibition and posted around 34,000 snapshots from it on their Instagram accounts, according to the museum.